Good thing I checked with you first!! 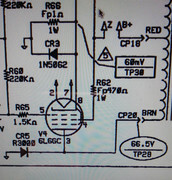 I don't understand why the schematic says TP28 should be 66.5 volts then? I guess my scope won't do then, right? Oh I see! But I don't understand the 1kHz test tone bit. I use that to calibrate sound on an old mixer or a tape machine, but never used it on a guitar amp. And shouldn't AC be a BIT more than DC? In circuitry where single power rail is used, as in tube amp you are working, AC signal is amplitude modulated on DC. So, at anodes you should read DC signal which is little bit lower than B+ (431VDC), without audio signal applied. When audio is applied, you should read AC signal at anodes with your scope set to AC. If you are looking at it with the scope set do DC, you will see AC signal modulated on DC (which is then lower than B+). Your scope probe should have an 10:1 attenuator. You can inject test signal from your card into "power amp in" jack when you are working only on output stage and you like to test AC parameters. But first, you should get DC biases and currents right. Without any audio signal applied. If you can, use a power resistor instead of speaker for testing purposes (ten 82ohm/5W resistors in parallel for example will do). I see, so oval values on the schematic are AC readings that should show when applying a 1 kHz test tone with the knobs placed as described on the schematic, right? Do you think I can use it on this amp to measure plate voltages as suggested? If your probe can be set to 100:1 then all voltages coming into scope would be 100 times lower so it will be on safe side. That's a test voltage, run at a fraction of the rated power. Used for assessing gain and making sure the amp is not clipping. You need high voltage probes, or you can DIY something. That would attenuate by about 100:1; not super accurate but good enough for troubleshooting. You would be good for about 500Vrms, 700V peak. I'm wondering if this probe would work with my scope? Please check first the probes you got with the scope. If they have 10:1 or 100:1 attenuation, you can use it safely. The probe I linked to on Amazon seems universal but I wanted to be sure. It's pretty cheap too so if it works with my scope maybe that would be a solution? Yes, definitely much better than my DIY suggestion. Well I'll order it and report back when I've made the readings. > Please check first the probes you got with the scope. If they have 10:1 or 100:1 attenuation, you can use it safely. Divider probes have a compensation cap, *series* with the source. I learned (the hard way) these are 500V caps. 10:1 probe, 550V DC, you are AT the cap rating even before you put signal in. ZAP. Probe stops dividing, and the housing may be melted around the trim hole. I like Abbey's home-made divider, or a for-purpose High Voltage probe. I've never experienced such misfortune. Probably had only high-quality probes. The ones in the previous link are rated "Maximum operating voltage : 1000V DC + ACPP"; they should be ok for a DeLuxe but barely for a DeVille. If DIY a high voltage divider, keep in mind that many resistors (especially high resistance smaller package ones) do not deliver rated resistance at voltage (check the resistor data sheets for rated voltage) . I discovered this when designing my outlet tester that had to meet insulation specs at 500V. I had to use larger SMD package resistors to meet voltage spec. The HV probe is due to arrive tomorrow. Meantime I've been thinking: when I cleaned the area I noticed that the resistor's pad were dead. Half melt, they came off with the resistor that broke in pieces as soon as I touched it. So I scratched the board to uncover a bit of trace on each side and soldered the new resistor bending the legs over the traces (does that make sense?). Maybe it would be a better idea to do that differently? Test point 30 is measured in DC V. The voltage across a 1R resistor will give you the cathode current of the 2 tubes in ma. Make sure your tubes match. With this setup, it will be harder to check this yourself. TP28 I think is going to be AC voltage. DC Voltage at that test point should be in the hundreds of volts (in a Deluxe, that will be in the high 380s to 400v range) but push the amp and I could see that being the AC voltage in that point in the circuit. That resistor was probably a casualty. When tubes pop, they tend to take the screen resistors and cathode resistors with them. That 1R I wouldn't worry about (Dont get me wrong, still check it but I wouldn't suspect it being damaged) but in cathode biased amps, I'd consider the cathode resistor and bypass cap suspect if a tube blows. So it's ok to repair it that way? Ive had that happen to me before. If the trace to the next part is short enough to bend the lead to follow the trace, you should be ok. Make sure to secure the lead down so it doesnt move or short. If the pad is too far away to bend the lead to follow the trace, Ill take some solid core wire and make a new trace with it securing it down with silicon in places along the way. Sorry for the delay, I've been sick with flu a few days. I then took out the limiter and switched the amp on with tubes but no guitar. The amp was silent and behaved as expected when tinkering with the controls, channel switch etc, BUT as soon as I plugged the guitar in the noise started again. Switching it off and back on after a few seconds wouldn't "fix" it. I also checked bias and the DMM showed 62v, so that should be ok I guess. This kind of behaviour reminds me of bad solder joints I've had in some of my past builds, but I'm not sure that the failing tube could cause that in this amp (all my builds are p2p). I have had to touch up solder joints on PCB tube sockets more than once. Pull the tubes and reflow with a bit of fresh solder. Solves lots of intermittent noises and other problems and it only takes a few minutes.